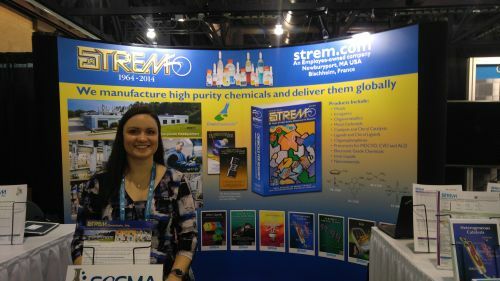 Strem Chemicals, Inc. @ ChemBuyersGuide.com, Inc.
Strem Chemicals, Inc., established in 1964, is a privately-held company that manufactures and markets specialty chemicals of high purity. Its clients include academic, industrial and government research and development laboratories as well as commercial scale businesses in the pharmaceutical, microelectronics, chemical and petrochemical industries. A wide variety of fine chemicals are available with special emphasis on organometallics, catalysts, ligands and nanomaterials. Quality is the most critical component of all products and services. Most products are of high purity, typically at 99%, while some are as high as 99.9999% metals purity. Metals, Inorganics, organometallics, nanomaterials for research. Metal catalysts for organic synthesis, chiral ligands, organophosphines, metallocenes, metal carbonyls & derivatives, precious metals and rare earths. Volatile precursors for MOCVD and ALD. Nano materials including nano powders, nano particles, nano colloids and magnetic fluids. High pressure reactions. Pharmaceutical intermediates under validated cGMP facilities. Custom synthesis. (1R,2R)-(-)-[1,2-CYCLOHEXANEDIAMINO-N,N'-BIS(3,5-DI-T-BUTYLSALICYLIDENE)]MANGANESE (III) CHLORIDE, 98% (R,R)-JACOBSEN CAT. (1S,2S)-(+)-[1,2-CYCLOHEXANEDIAMINO-N,N'-BIS(3,5-DI-T-BUTYLSALICYLIDENE)]MANGANESE(III) CHLORIDE, 98% (S,S)-JACOBSEN CAT.